Posted by Shelley Grell on July 3rd, 2013. 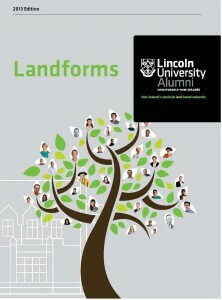 Lincoln University’s annual alumni newsletter is out and packed with entertaining stories and news developments on and off campus. We once again helped out with some colourful articles including a profile of graduate Ruth Seba, who now runs a jewellery business in Croatia, an introduction to Telford Director Charley Lamb and an update on the achievements at Lincoln University Dairy Farm.